There are a lot of dorm essentials to think of when you're making your college dorm checklist. You have to think of a whole bunch of things like Twin XL Dorm Bedding for the whole college year, and when it comes to the holidays, you have plenty more to think of! You have to decide on a dorm Christmas tree that will go well with the rest of your dorm room decorations while still thinking about the size of your college dorm room. You also have to think of the holiday dorm room decorations you want to place on your dorm Christmas tree. This is a fun thing to think about and it's where you really get to plan out your dorm room decor for the holidays. Once you have your dorm Christmas tree, you need to add your ornaments, mini dorm lights, and garland. You don't want to forget about any of those pieces because they blend together to create a cool look for your dorm room decor. 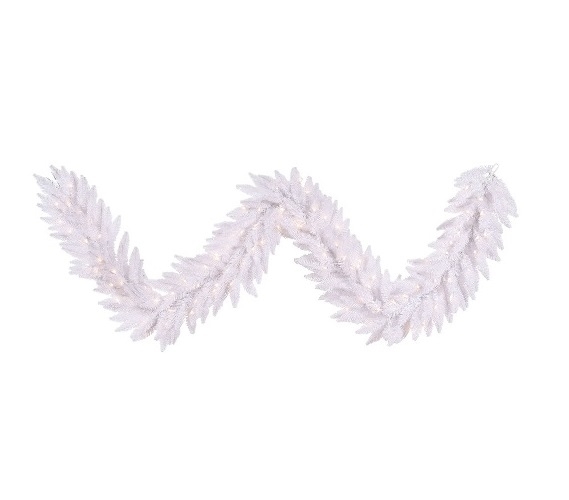 Once you've picked out the perfect dorm Christmas tree, add our 9'x14" White Fir Garland with Mini Lights. This dorm essentials item is in a classic white style that will go with your dorm Christmas tree and dorm room decor, no matter what color scheme you have. Plus wrapped with this dorm necessities item is a strand of Clear mini dorm lights on white wire, saving you time on your dorm room decorating because you have two dorm items in one!